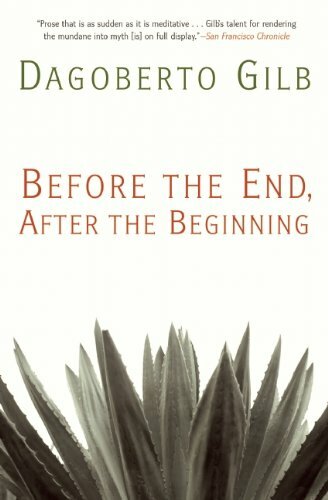 Before the End, After the Beginning is a collection of short stories from acclaimed, award-winning author Dagoberto Gilb. These stories are ten slices of life that take the reader on a journey from the perspective of Mexican Americans. Readers may think they already know what they will find, but they will be surprised just as much as the protagonists themselves. The stories show people who are trying to live their lives in peace like anyone else. Sometimes they make the wrong choices and have to deal with the consequences, or their own paranoia that trips them up, and sometimes the assumptions of others cause trouble or anxiety. Assumptions are not always best or reliable. Readers often assume that all stories written by fiction authors are either entirely or semi-autobiographical; however, many authors will admit that very little material (if any) comes from their personal lives—except, perhaps, for the kernel of inspiration that fires the writer’s imagination. Scholars of Mr. Gilb’s canon of work may have more insight into this, but the stories in this collection all have a tone of authenticity to leave the reader wondering if Mr. Gilb is drawing from the well of experience and not just a keen perception of human nature. The answer is: probably both, which is what most writers would reply. If “please, thank you” is rough to read because of the typos and lowercase letters, then it has done part of its job to convey the first-person narrative of a man recovering from a stroke and learning to communicate again; the other part is to give voice to the frustration and depression that can come from being in hospital. What makes this story even more poignant is that author Gilb suffered a stroke in 2009 and many of the stories in this collection were written and compiled in the months that followed. In “Uncle Rock” a little boy’s discomfort at his mother’s popularity with men makes him realize that sometimes being down to earth is more preferable than glitz. He learns a lesson at a young age that many adults never do and he becomes wiser for it. “Cheap” gives a look at modern indentured servitude in a world where issues like economics and immigration is on the minds of many people while also making one man question his own beliefs or indifference. The story is aptly set in Texas and shows how Texas—and Texans—are full of contradictions in their mindset that display both a depth of humanity one minute, and pure callousness the next. Perhaps it has become an expectation or even a convention in some literature, especially when written from the standpoint of a non-WASP, that there must be a dark, sinister outcome at the heart of the matter; that the only way for people outside of a culture to understand the struggles of that culture is to present the doom and gloom. Or maybe we are more cynical as a whole. Before the End does offer a sense of waiting for the other shoe to drop, the sword of Damocles hangs over the head of the protagonist in several of the stories like in “His Birthday” and “Blessing,” but once again, such assumptions can mislead. The recurring themes of identity and race stem not just from the assumptions made by other races but within the Mexican-American community itself. Is the proverbial American Melting Pot a good thing or a bad thing? The tug-of-war between identifying with America or Mexico or Spain—or none—has affected the lives of the protagonists from things like being hassled for “driving while Hispanic” or suspicion of being an illegal alien or a drug dealer. With this kind of atmosphere, it is not always easy to do good even when your heart is in the right place (“Willows Village,” “Blessing,” “Why Kiki Was Late for Lunch”); and while it is easy to presume something of a person based on outward appearances, more often than not, that presumption is just plain wrong. The racial and cultural issues throughout the stories don’t come across as militant or preachy. In fact, the subjects appear sometimes only because a character in the story brings it up. These issues could be silent bystanders, like in “please, thank you,” or they could be represented by the story’s protagonist himself (“To Document”). But not everyone wants to escape and there comes a time when great pride and appreciation of culture reveals itself. This sense of appreciation may be lost on the young, but with age usually comes wisdom. In “Hacia Teotitlán,” Ramiro wants to reconnect with his roots before it is too late. He creates a sort of homecoming for himself but discovers he’s like a stranger. People and cultures may spring from the same root but when it branches, it changes into something different, and sometimes the branches are so far from the root that it’s hard to tell they are connected. Yet this is a book review and not meant to be a long dissertation about race and political correctness. Not all stories have a direct reference to the time in which they are set, but it only adds to the idea that they could have happened in the distant past, recent past, or reflect what is happening now. It’s a little disconcerting when trying to wonder if society has “progressed” at all. handles writing in either viewpoint masterfully, displaying his talent for powerful storytelling. One thing is for certain and that is readers will absorb these characters and empathize and remember them. Before the End, After the Beginning is a short book but will leave an impression for a long time.